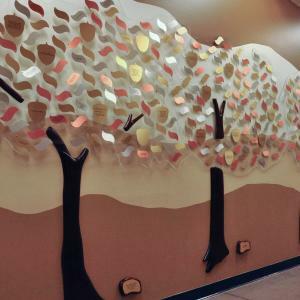 535 - 3 1/4" x 5” x 1/4" acrylic leaves have colors printed on the backs. 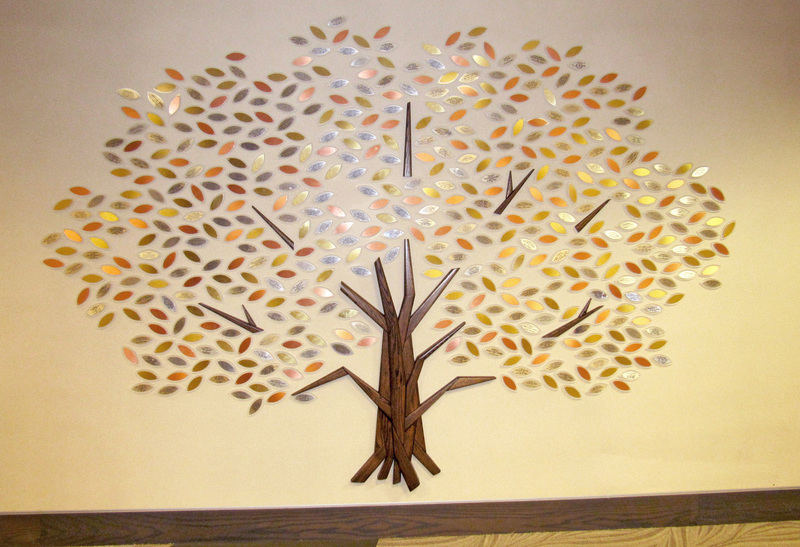 The leaves are mounted to 3/8” clear acrylic leaves which are permanently affixed to the wall. 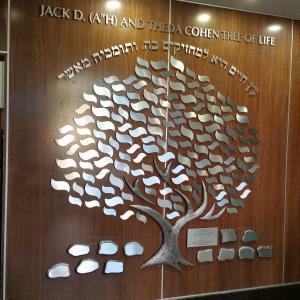 Individual 3/16” thick satin aluminum letters and your logo title the wall. 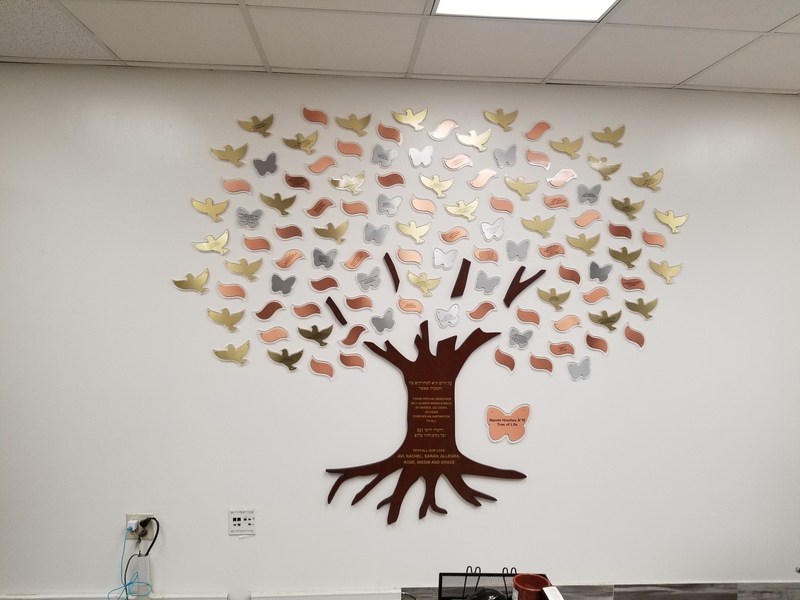 3/4" Mahogany wood donor recognition tree base, has 50 copper leaves, 20 aluminum butterflies, and 36 Brass doves mounted to individual 3/8" plexiglas backgrounds. 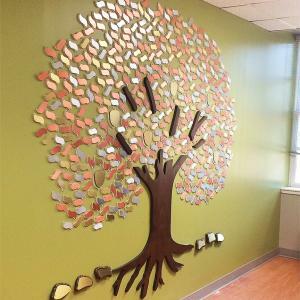 Oval leaves and rocks are fabricated from decorative copper and aluminum laminates. 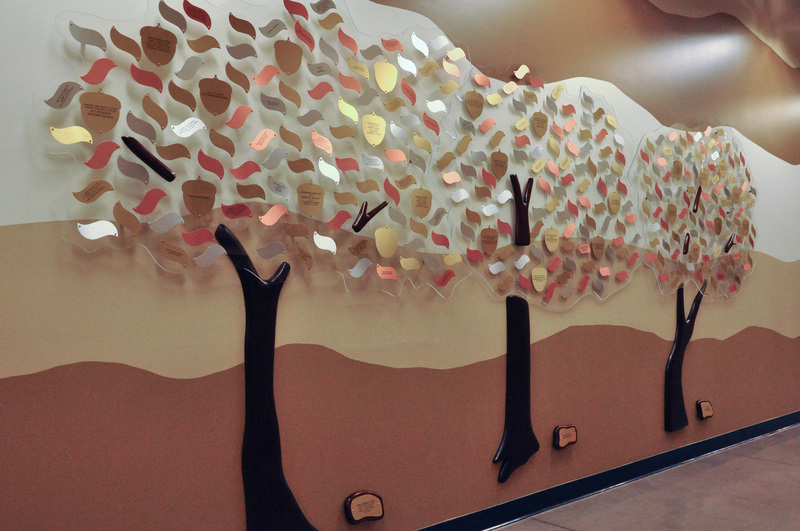 They are mounted to 3/8" clear acrylic ovals. 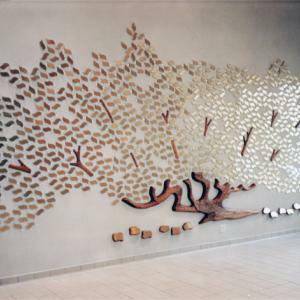 5 - 7" x 9" and 18 - 5" x 7" copper stones are mounted to 3/4" walnut. The quadruple donor tree base is fabricated from exotic walnut. 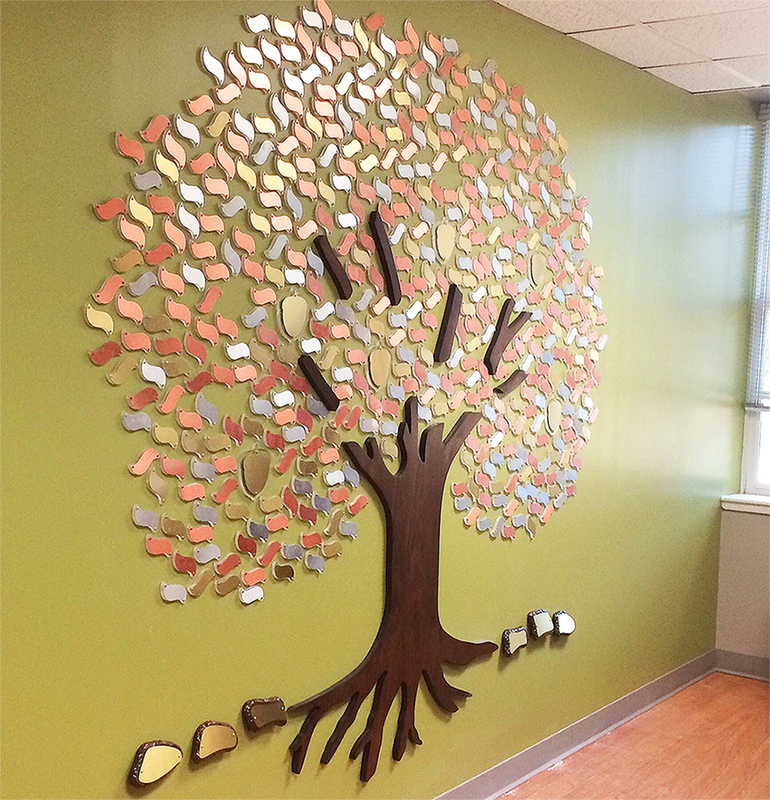 1000 2" x 4" brass leaves on 3/8" thick Plexiglas leaves are installed in a scatter leaf donor wall tree design. 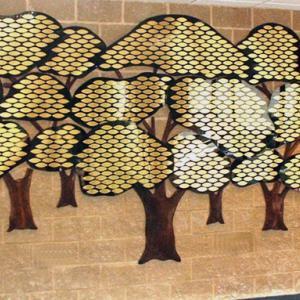 The base and branches are carved oak. 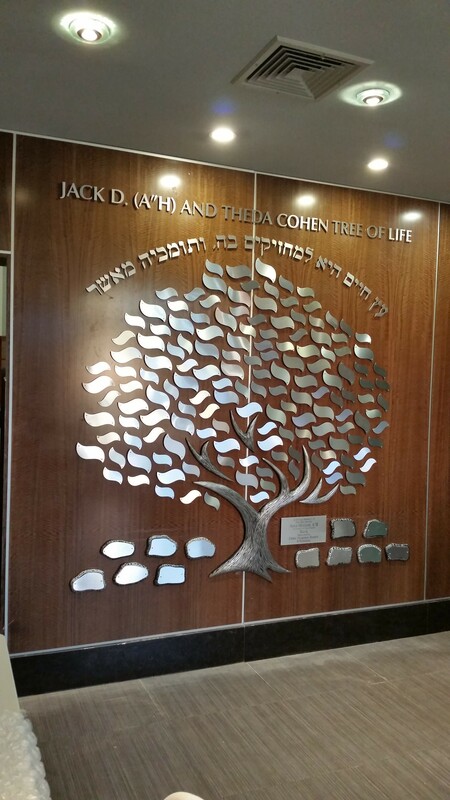 Prominent donors are recognized on oak and brass rocks. 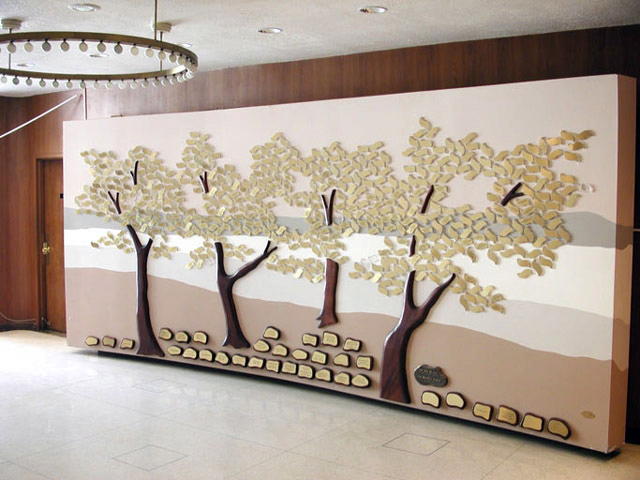 500 - 1 1/2" x 3 1/2" brass leaves, affixed to 3/8" Plexiglas leaves, are mounted between hand-finished mahogany donor tree bases and branches. 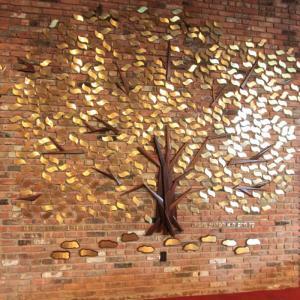 Brass and mahogany rocks recognize large donations. 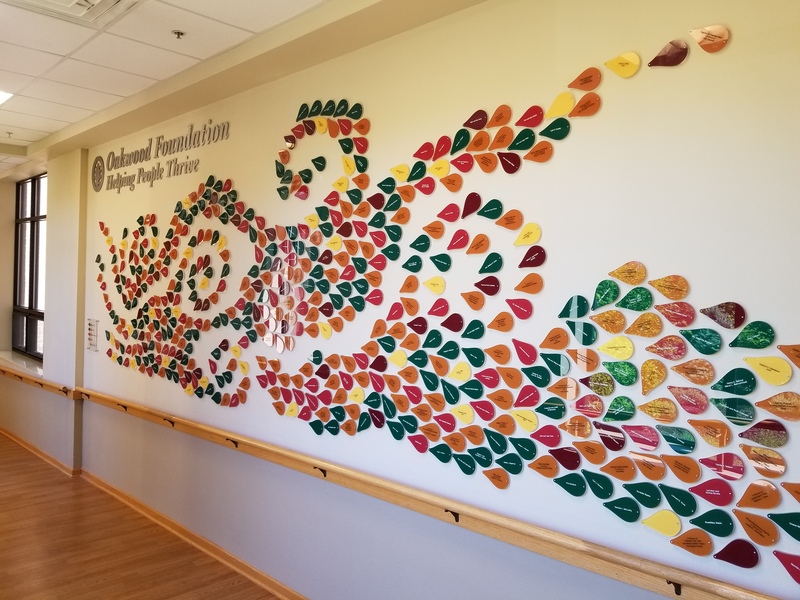 The Scatter Leaf donor tree of life has a base, fabricated from multiple layers of angled mahogany, anchors this powerful 500 2" x 4" leaf design. 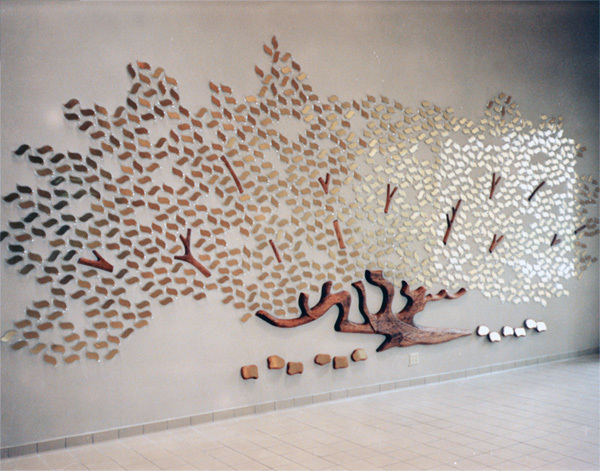 Mahogany branches are dispersed through the Plexiglas mounted brass leaves. 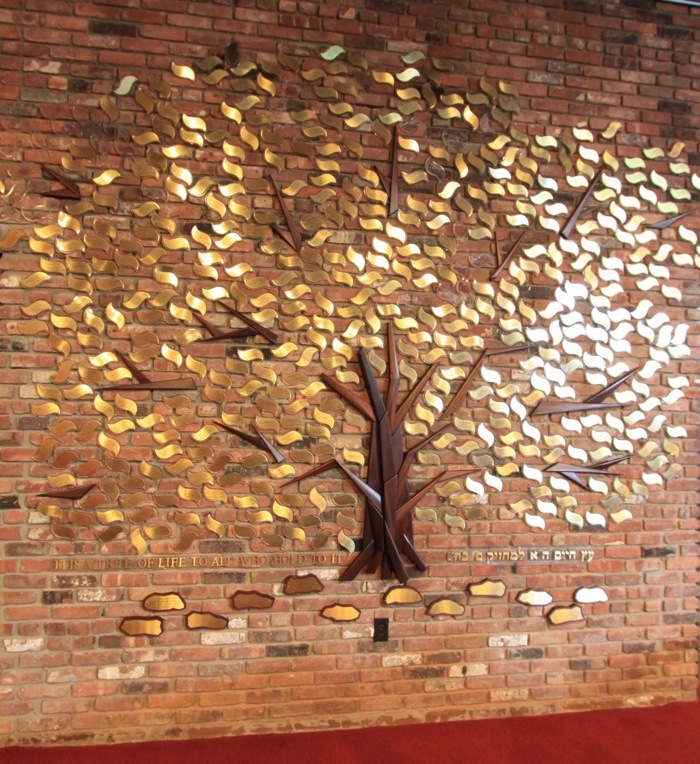 Tree of life with aluminum, brass and copper leaves on individual Plexiglas shapes mounted directly to the wall. 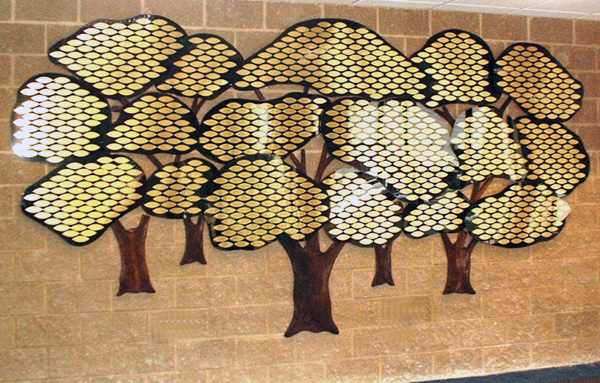 Brass acorns on Plexiglas shapes mounted to the wall. Dark Walnut base. 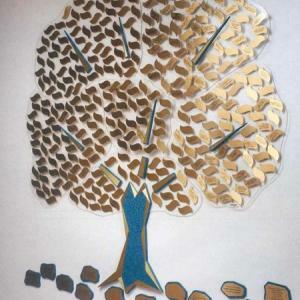 Dark Walnut and brass rocks. 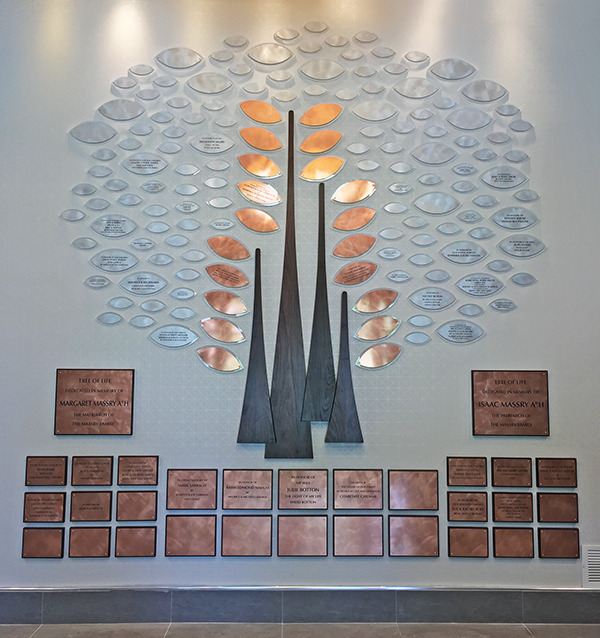 Donor wall with three large trees. 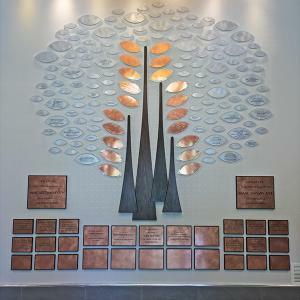 100 brass, 100 aluminum and 100 – 2" x 4" copper leaves and 26 blank brass acorns, are mounted in a scatter leaf design to 1/4" multi-elevational clear Plexiglas islands. 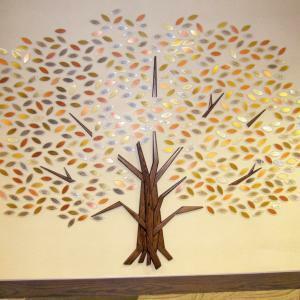 The 3 bases and branches are mahogany with a rounded gloss finish. 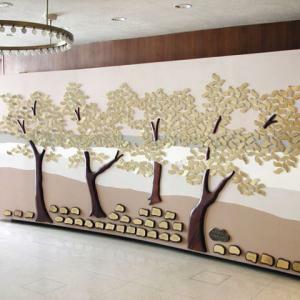 These donor recognition trees have beautifully stained birch wood trunks float above a rolling green berm. 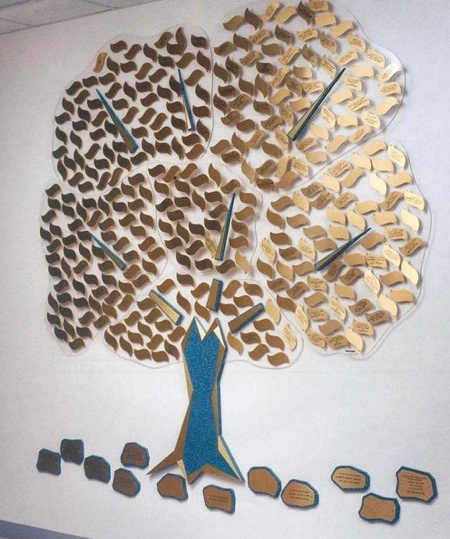 Brass leaves are affixed to individual Plexiglas leaves. 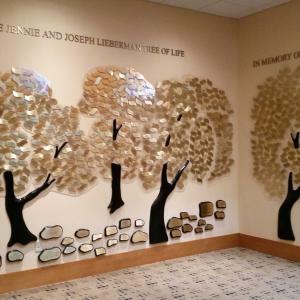 900 – 2” x 4” brass leaves are mounted on multi-elevational clear Plexiglas islands. 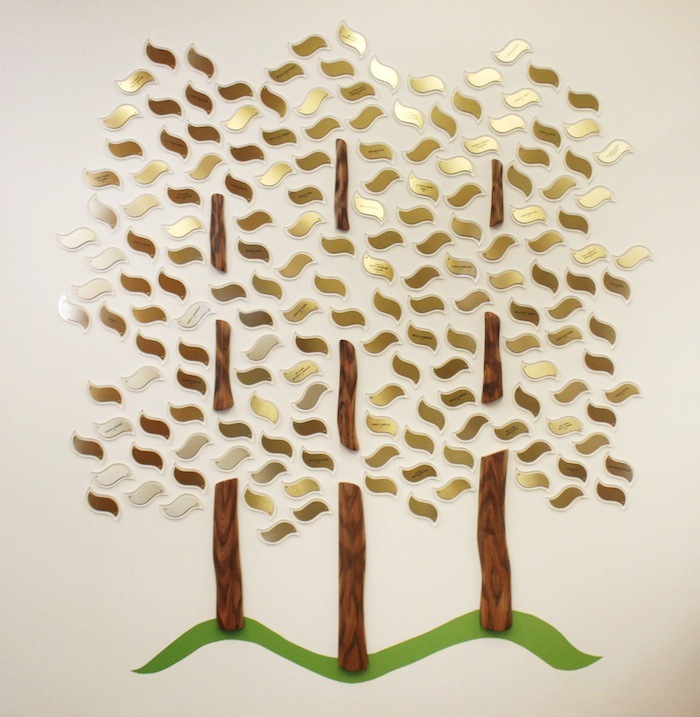 1000 - 1 1/2" X 4" brass leaves mounted on multi-elevational smoked Plexiglas islands. 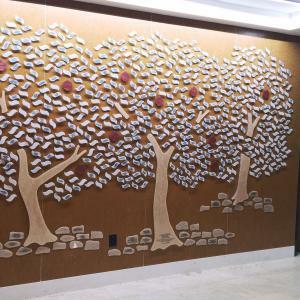 The bases and branches are carved walnut. 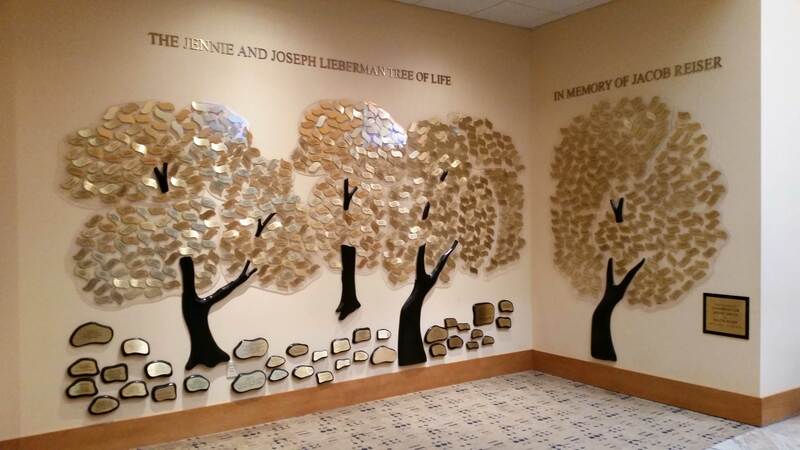 Rocks for larger donors anchor the display. 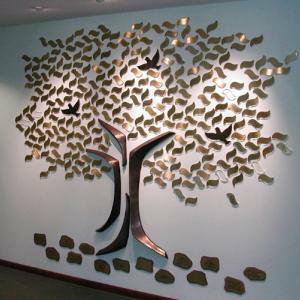 300 2" x 4" brass leaves on 3/8" Plexiglas leaves, along with copper and Plexiglas doves are mounted directly to the wall. 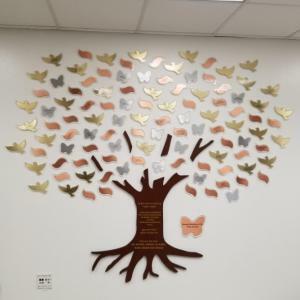 A carved wood base anchors this unique Donor Tree. 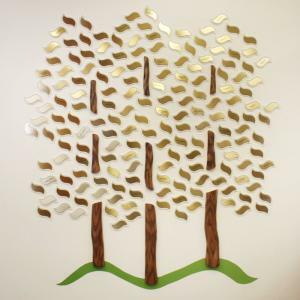 672 white acrylic 1 1/2" x 3 1/2" leaves are mounted on elevations directly to a paneled wall. 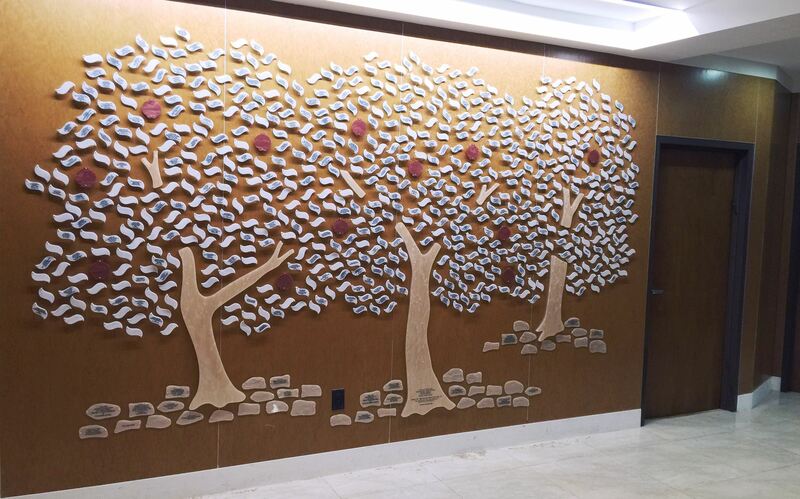 The base, branches and rocks are pearlized acrylic. 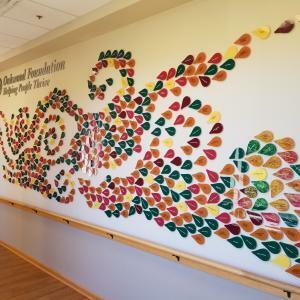 Dusty rose acrylic pomegranates are scattered through the design.